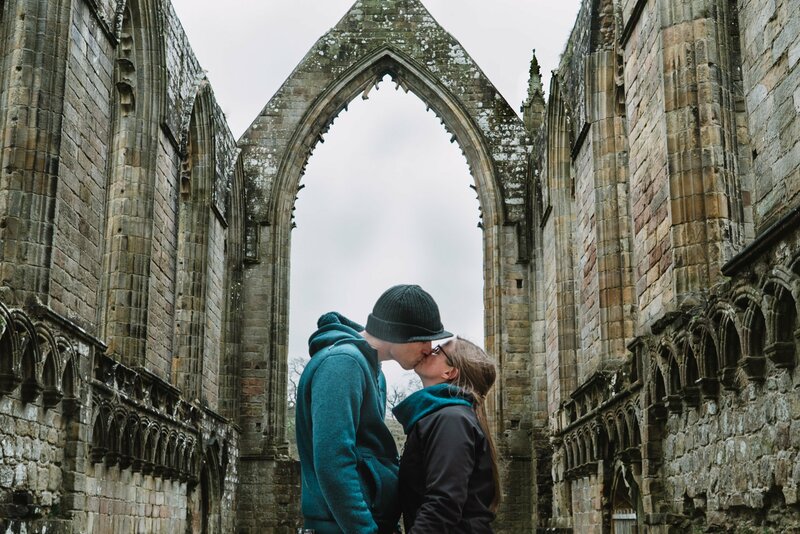 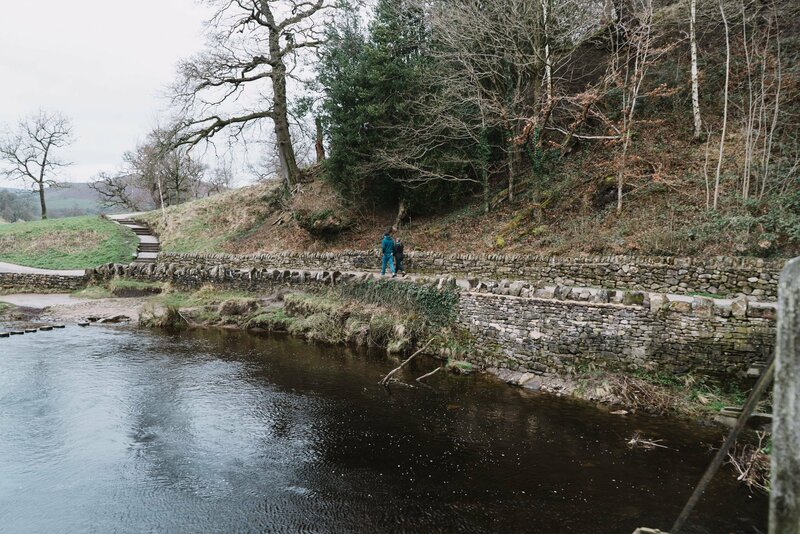 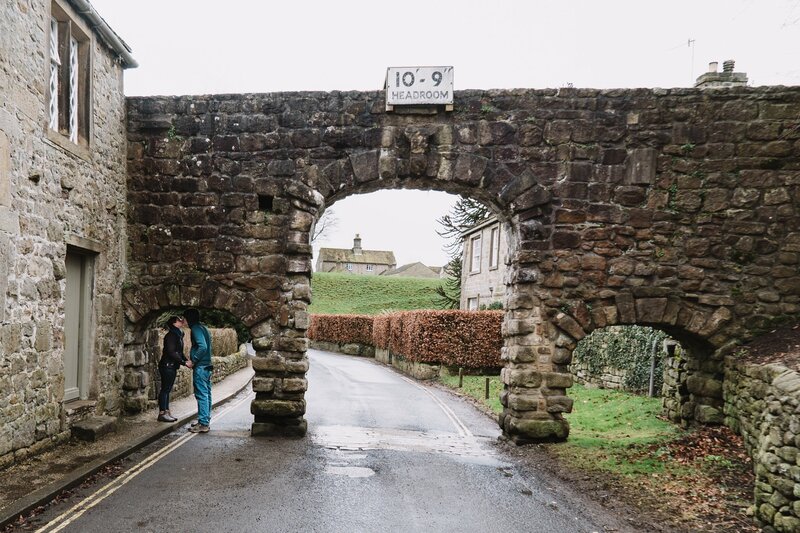 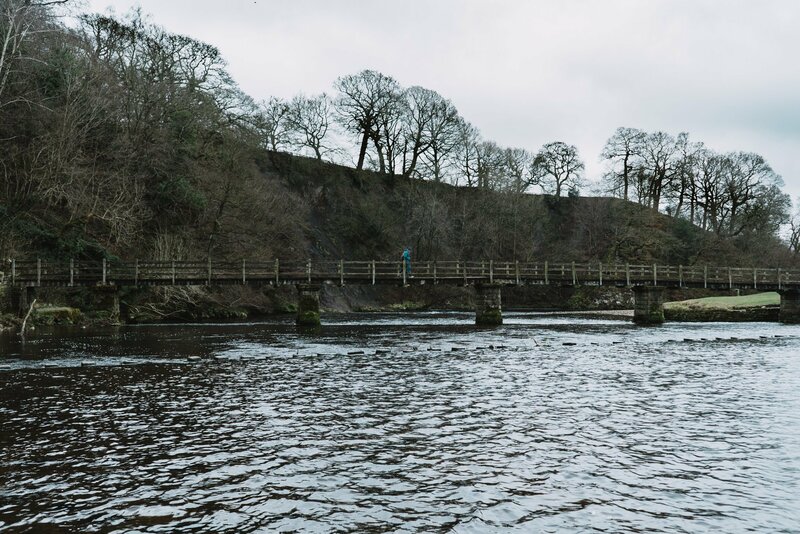 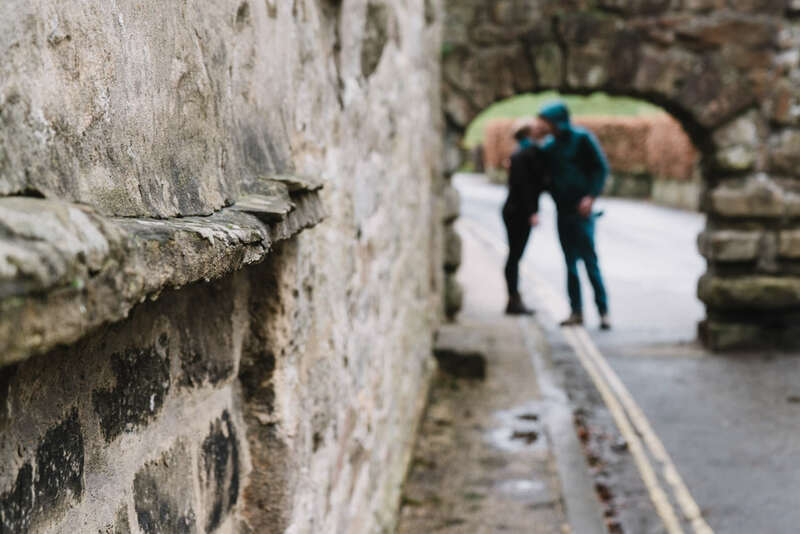 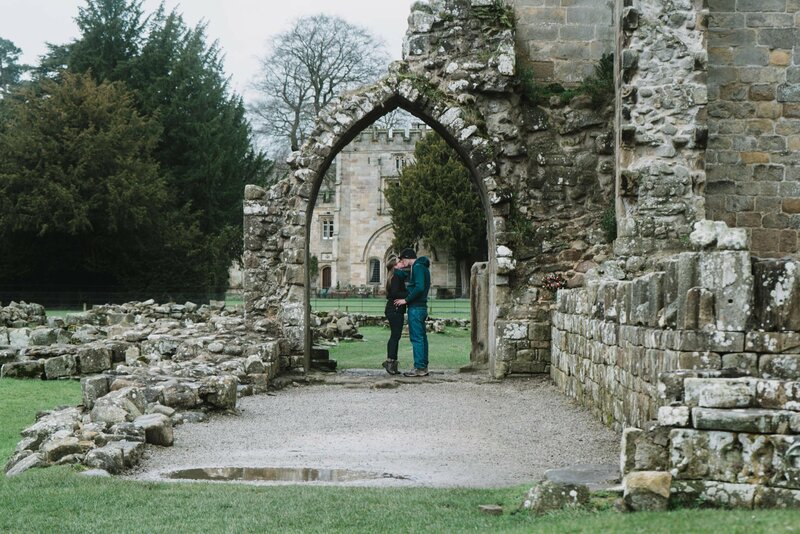 March 23, 2017 / THEY SAID "YES"
Bolton Abbey, North Yorkshire is the perfect setting for an engagement shoot – especially on a cold and rainy day like Lizzie and Dave had as we were the only people there! 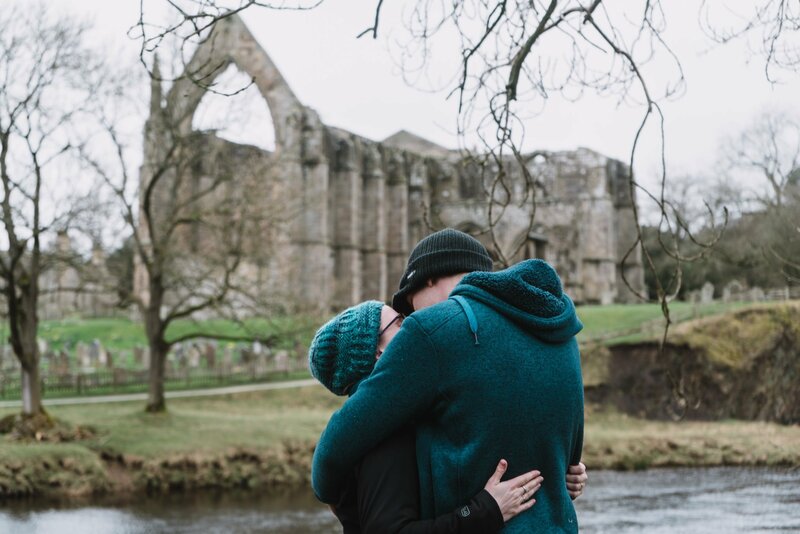 As Leeds wedding photographers we know the Bolton Abbey grounds well and were so excited by their choice. 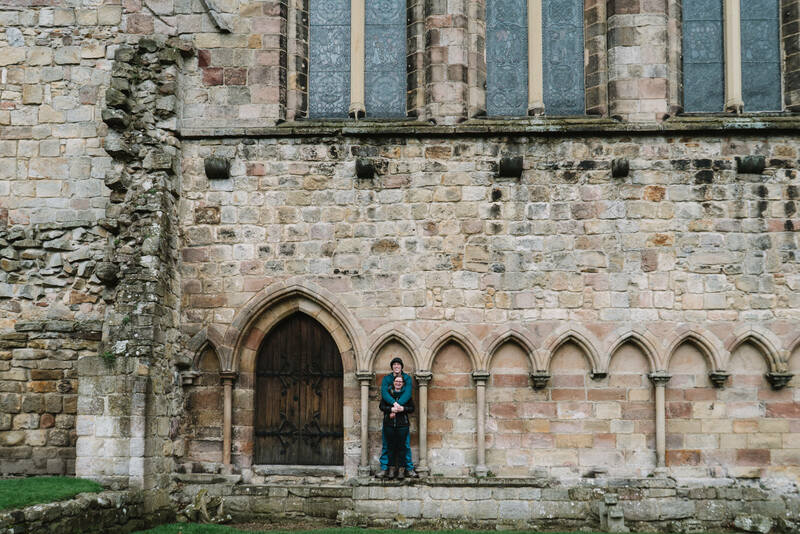 Our day was spent capturing this beautiful couple’s personalities while the impressive background shone through. 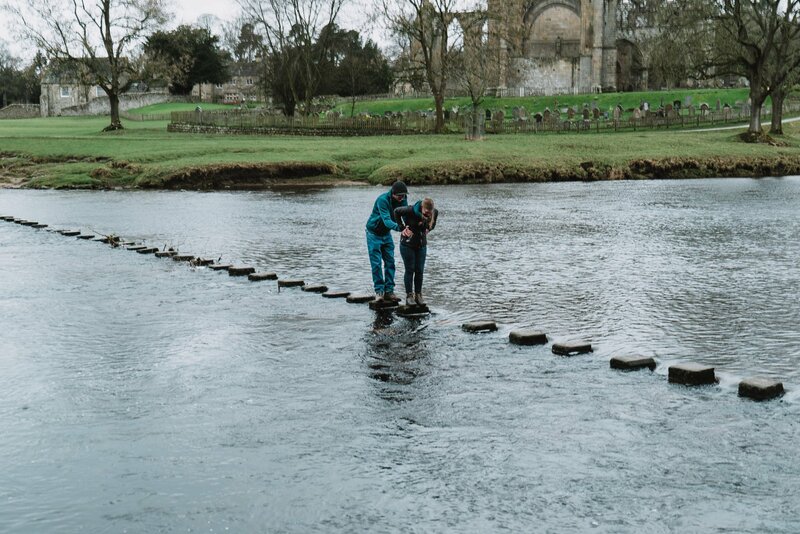 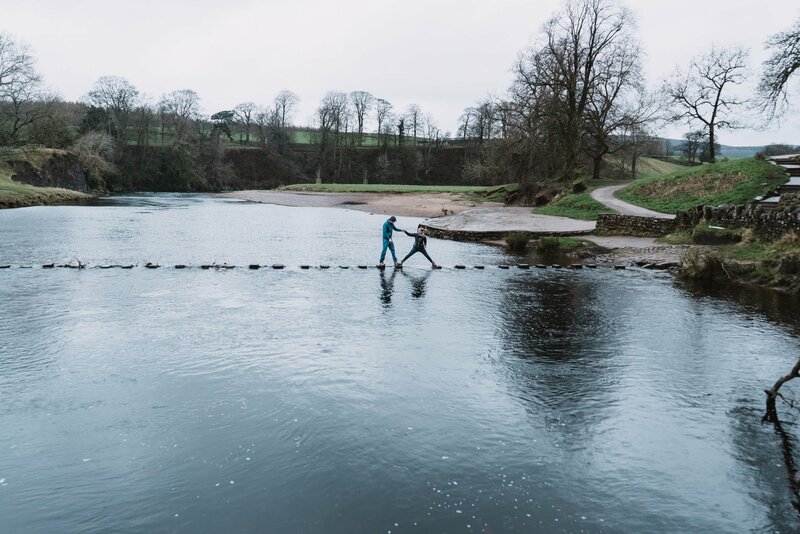 Following stone skimming with the challenging stepping stones. 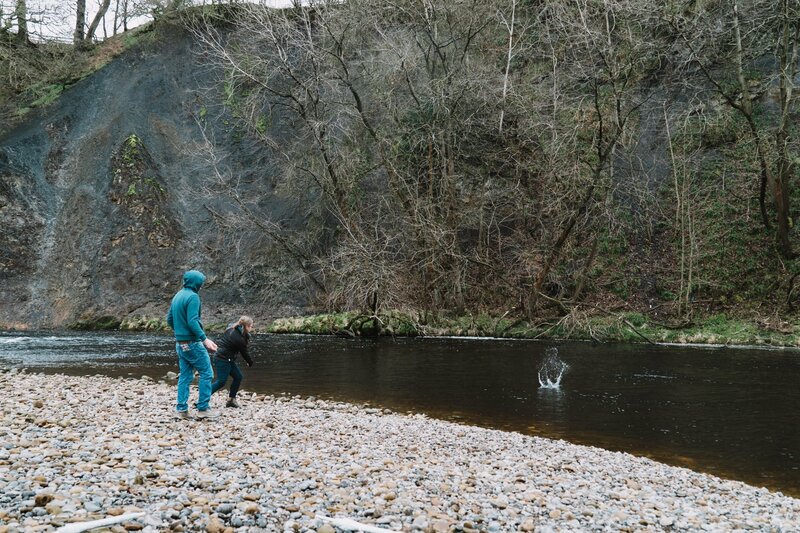 A little more dangerous than usual with it being wet, cold, slippy and with one of the stones missing! 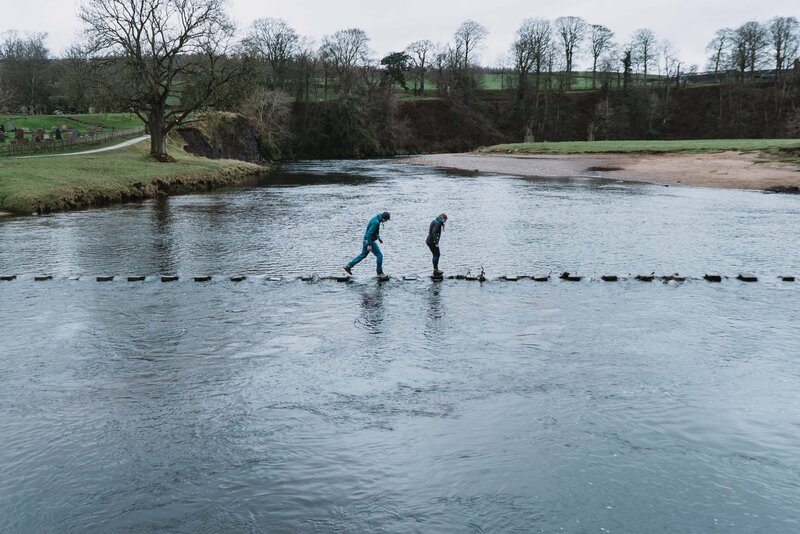 Working together they managed to make it to the other side with neither falling in! 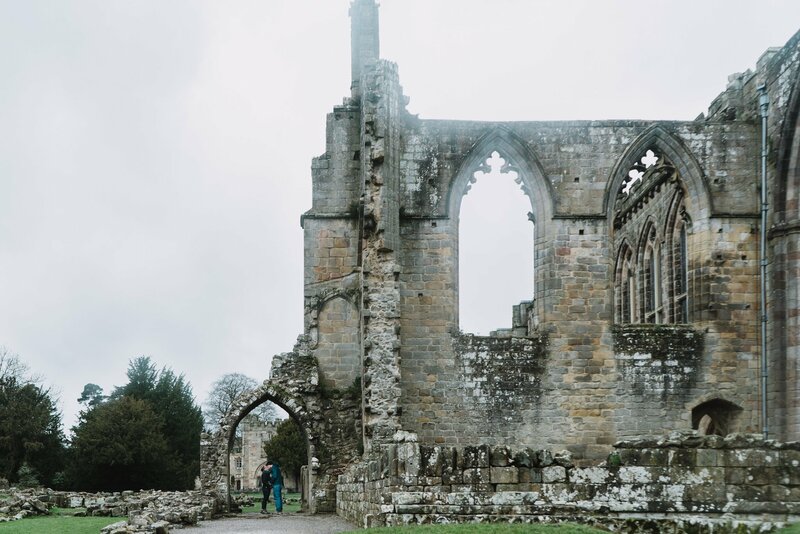 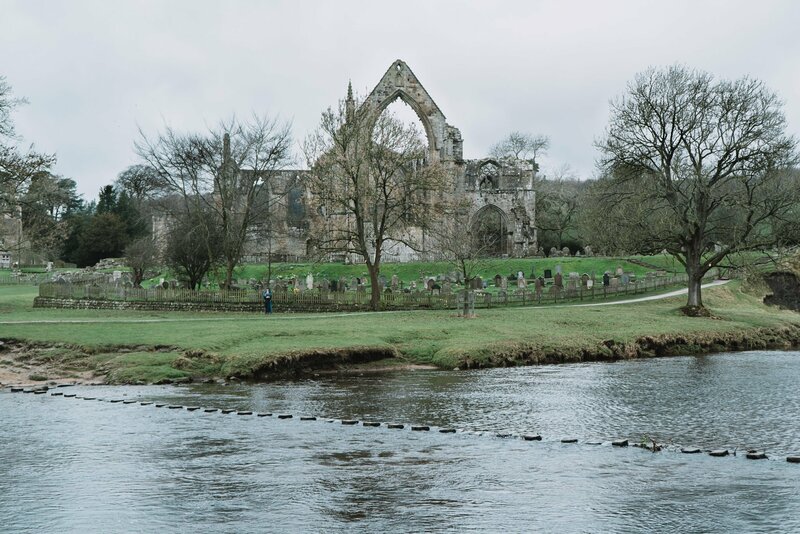 As they are not local to the Yorkshire Dales or Skipton we went around the grounds of Bolton Abbey to explore the magnificent architecture. 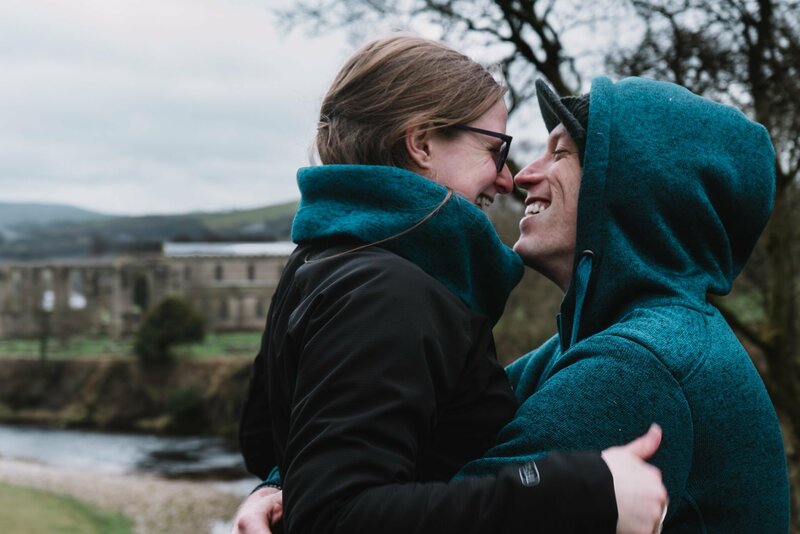 As we are a team of two wedding photographers it was easy to capture both the impressive distance shots and the little moments shared together. 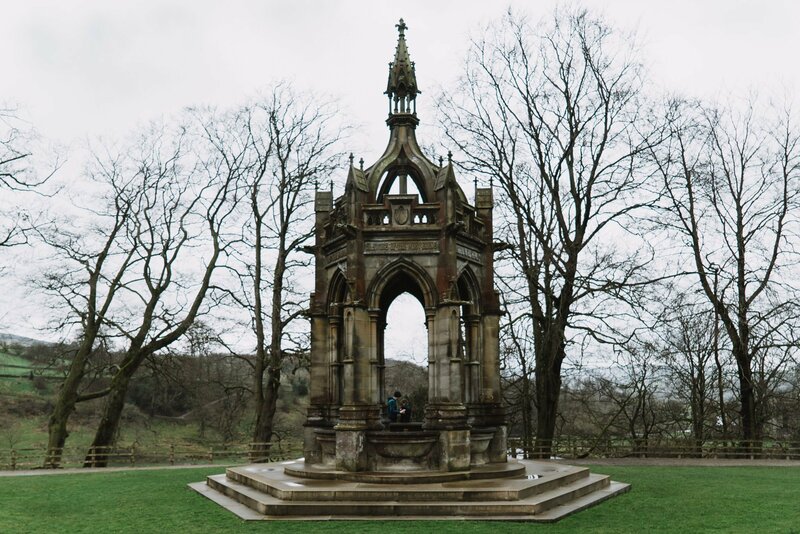 The Cavendish memorial fountain was a little hard to find but was worth the hill walk. 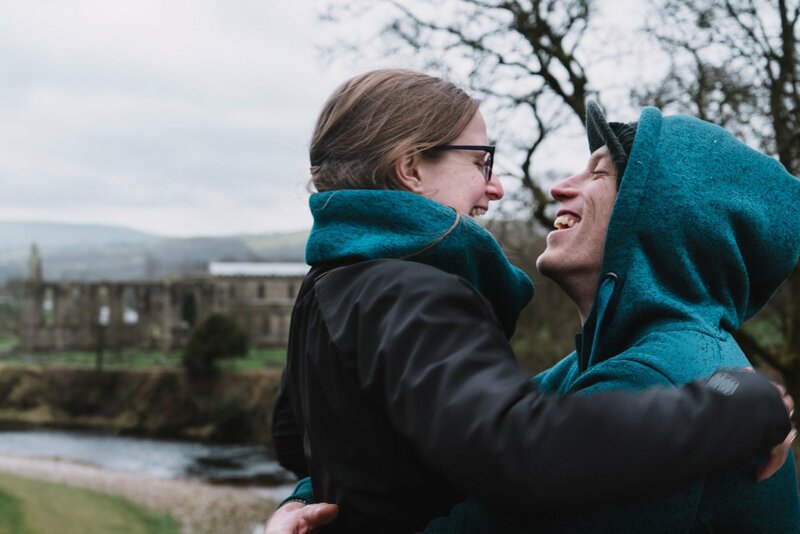 Our journalistic wedding photography style worked so well, capturing natural moments between Lizzie and Dave. 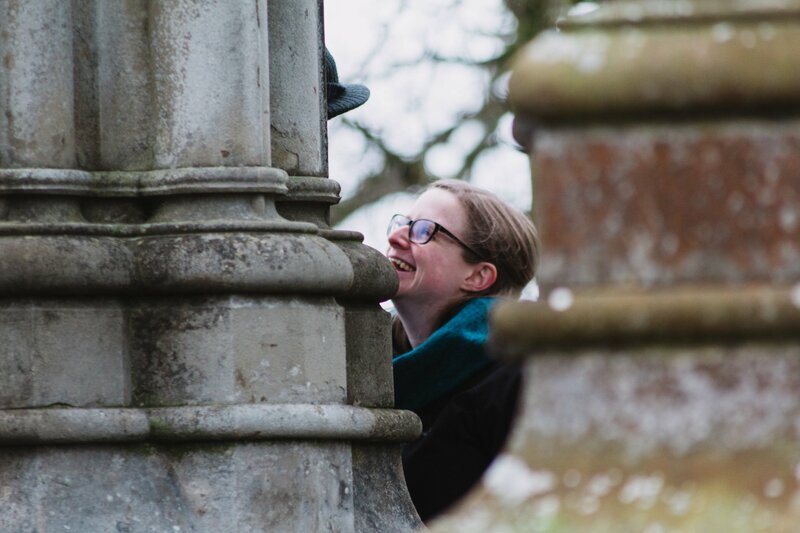 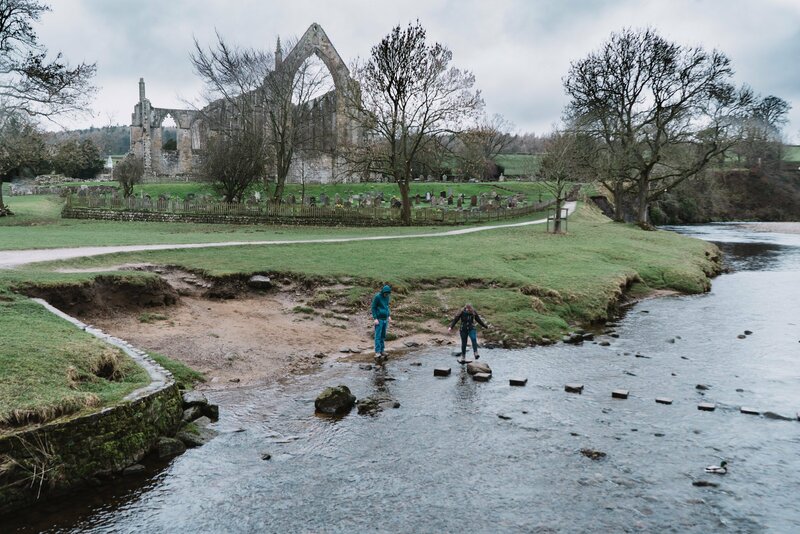 Not only did we love our photographs from by the fountain but we also found some spectacular views looking down on the Abbey. 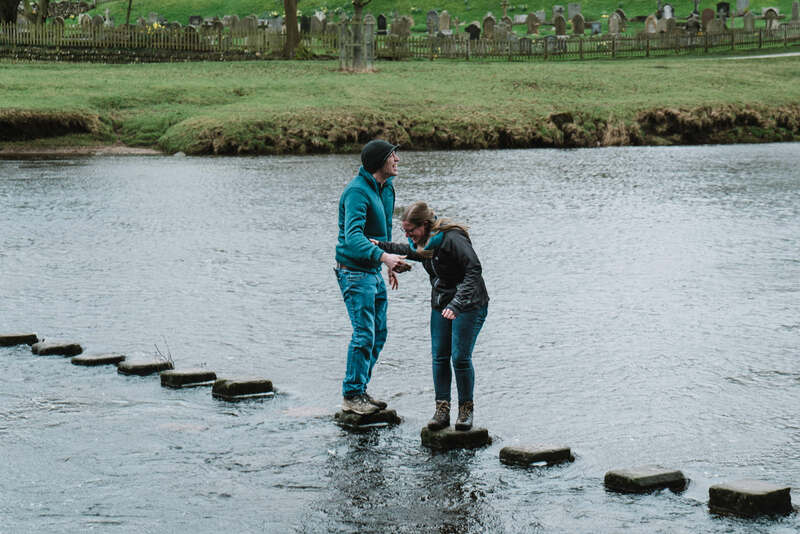 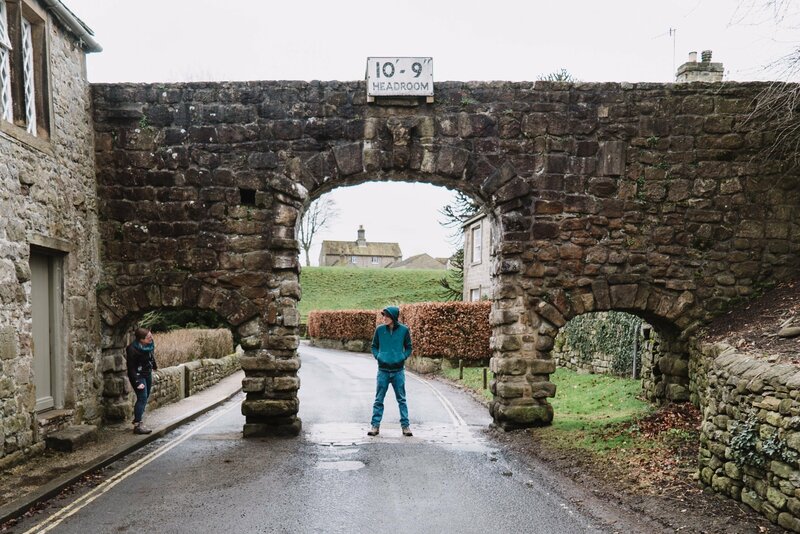 There is quite a height difference between Lizzie and Dave so this ‘Head Room’ bridge was a funny find! 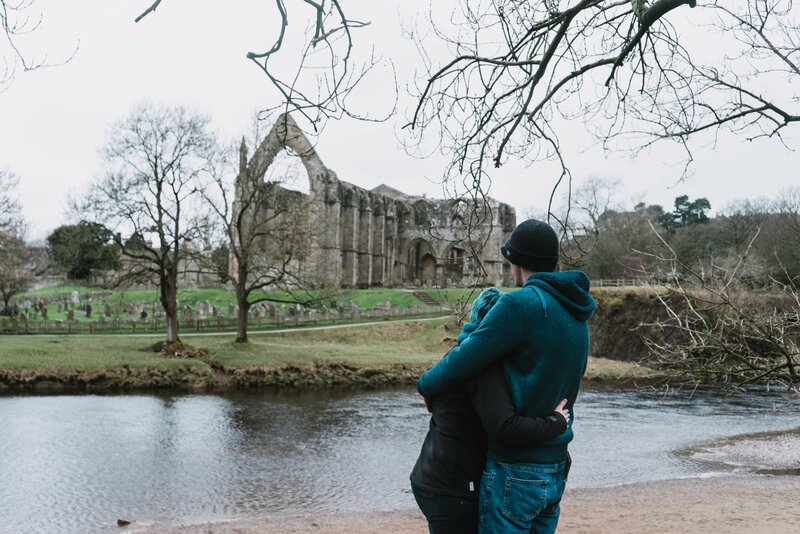 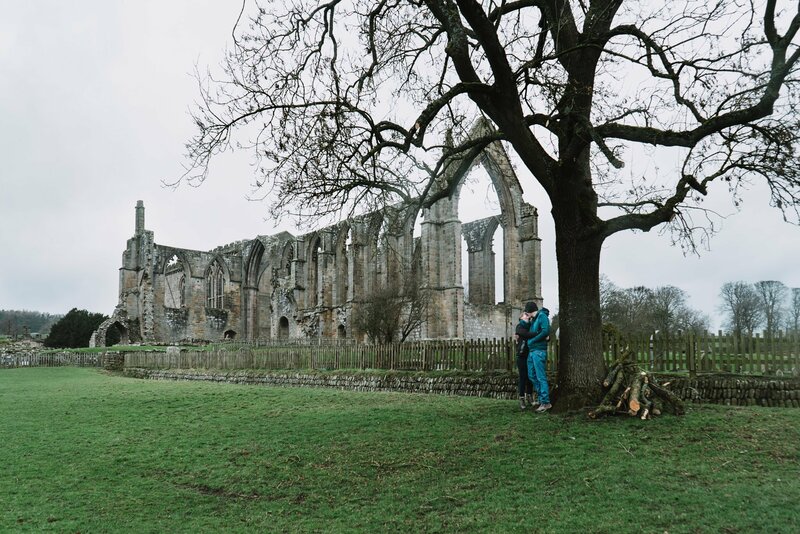 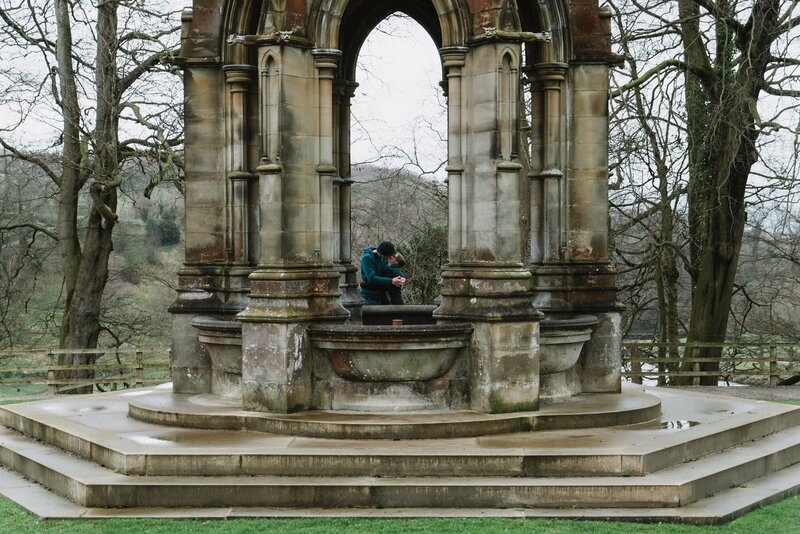 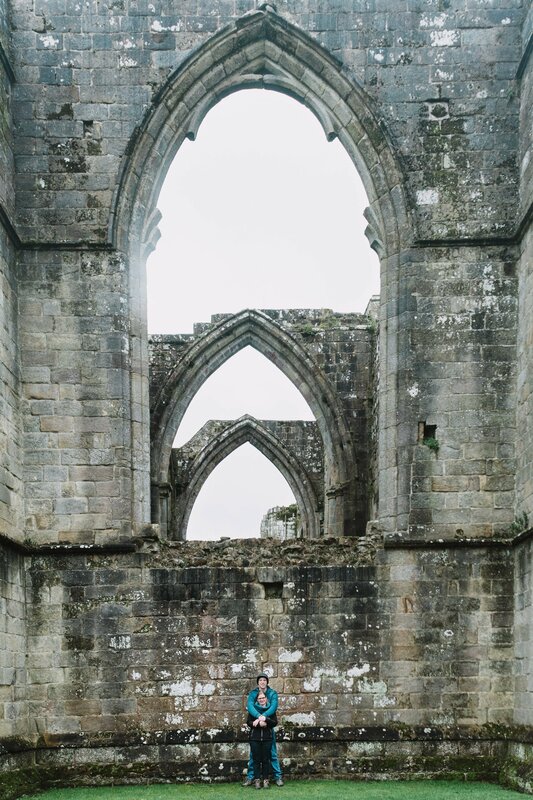 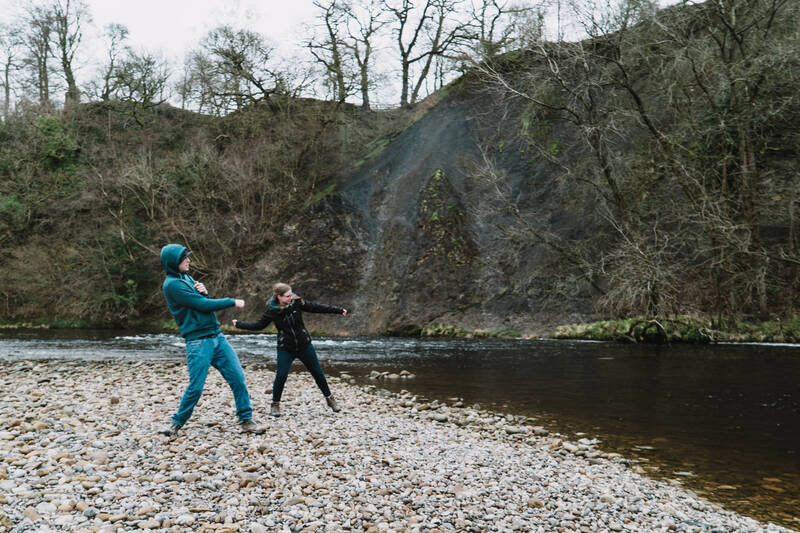 Leading to some playful shots that were a great way to finish their Bolton Abbey North Yorkshire engagement shoot. 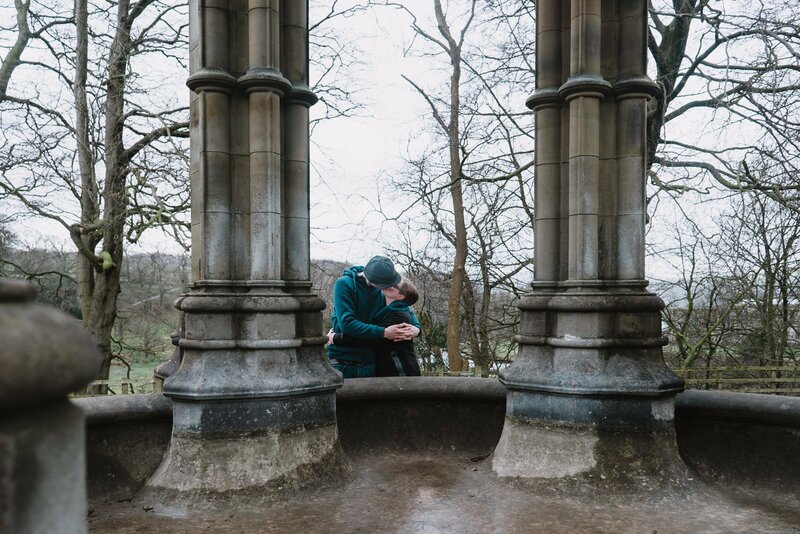 The weather is sure to be very different at their wedding in Belper as it is in July. 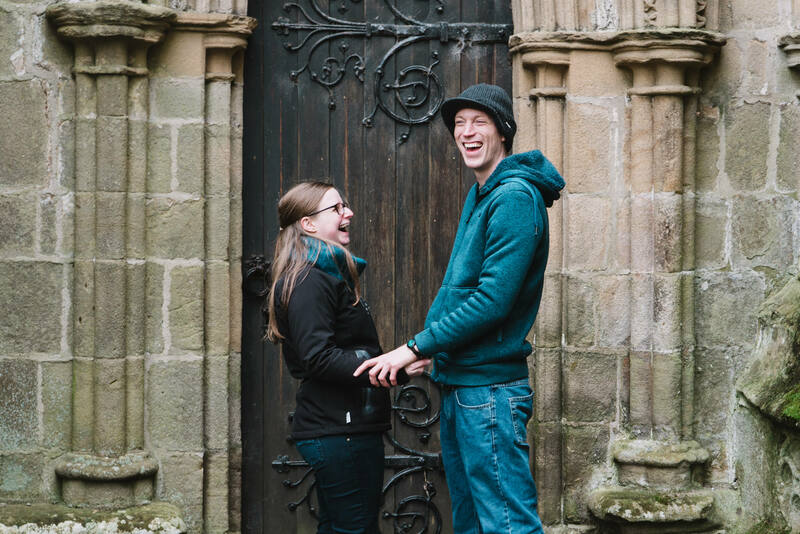 We are so excited about capturing their marriage this summer! 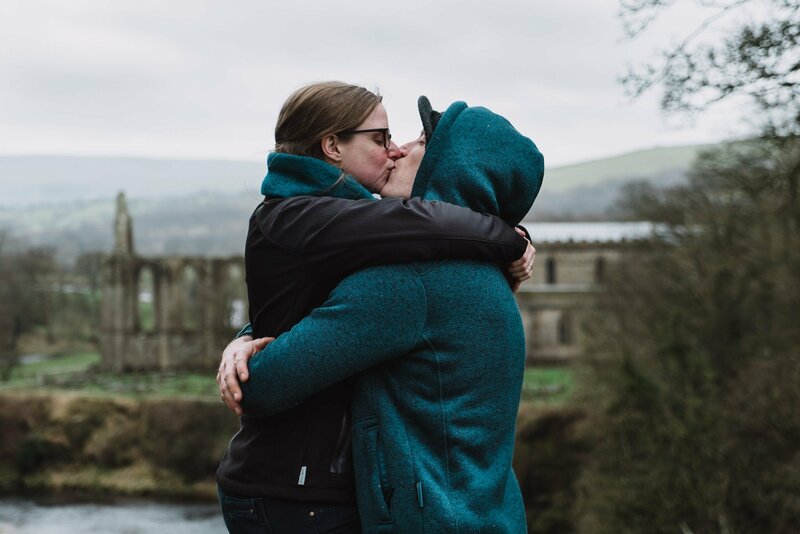 Langcliffe – Katie & Matt North Yorkshire Engagement THEY SAID "YES" York Marriot – Louise & Josh Engagement Shoot THEY SAID "YES" Roundhay Park Leeds Engagement Shoot THEY SAID "YES"